For over 35 years, American-made turbo® Precleaners manufactured by Maradyne Corporation, have set the standard for precleaner technology in industries around the world, including construction, mining, logging, waste, agriculture and aggregates – any application where dust and debris can cause problems for engines. What sets turbo® Precleaners apart from other precleaner brands is a straight-through airflow pathway which creates less air intake restriction to optimize engine power. Engineered paddles create centrifugal force which ejects up to 85 percent of contaminants through discharge ports. 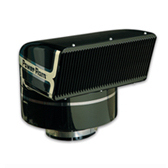 This unique design effectively removes airborne debris such as dust, dirt and moisture, including particles as small as one to two microns, ultimately allowing only filtered air into the engine for maximum performance. Reducing equipment downtime and achieving maximum productivity are major benefits of turbo® Precleaners technology. With a precleaner providing efficient pre-separation, the need to take equipment out of service for air filter maintenance is greatly reduced. turbo® Precleaners provides four different precleaner models designed for a wide range of equipment operating in light to severe-duty applications. From compact equipment to sweepers, crushers and massive mining drilling rigs, there are turbo® Precleaners available to protect a variety of machines and their engines, from 15 to 1500 CFM airflow range. All high-quality turbo® Precleaners are independently tested to ISO 5011 standards, and some models are available with extended rain cap, low-profile bull-nose or under-the-hood options. 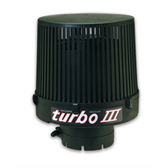 turbo® II – The original for over 35 years, often copied – never equaled. 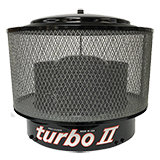 Manufactured with durable powder coated steel, the turbo II protects engines in equipment operating worldwide, including loaders, graders, crushers, haulers, mixers and mining machines. Airflow from 100 to 1100 CFM. turbo® HD – Tough made tougher. The NEW turbo® HD packs the same great features as the turbo® II with an added layer of protection— an additional prescreen that provides more than 3 times the debris catching surface area. Ideal for the most extreme work environments and a necessity for landfill and agricultural applications. turbo® III – Designed to be lighter and smaller, this durable, impact-resistant glass-reinforced polymer precleaner meets the performance needs of a wide variety of machines with engines requiring airflow from 15 to 1100 CFM. PowerRam™ – Designed for machines operating in severe-duty environments, its innovative directional scoop and wide-angled air intake improves engine performance by reducing air-intake restriction and delivering more clean air to the engine. Developed to meet the performance needs of engines requiring airflow from 400 to 1500 CFM, it is used on coal pushing dozers, snow removal machines, articulated dump trucks, concrete mixers, chippers, tub-grinders, mulching machines and for on- and off-highway trucks used in severe-duty applications. Flex-N-Line™ – For equipment that requires a precleaner that fits into limited under-the-hood space, Flex-N-Line is a low-profile, inline precleaner for a wide range of applications, including off-highway equipment such as cranes, tele-handlers, skid steers and other machines in which space is at a premium. The compact Flex-N-Line can be mounted either horizontally or vertically within tight confines under hood and within the engine compartment without changing the hood configuration. Airflow from 75 to 475 CFM. For over 35 years turbo® Precleaner has been the trusted name in heavy duty, engine Precleaners. 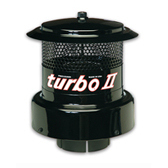 Machinery and equipment owners, operators and OEM’s have relied on turbo® for years to protect their engines. 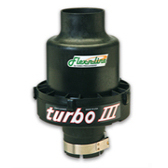 turbo® Precleaner continues to lead in all the markets we serve – often copied, but never equaled. As our team of engineers continues to improve the capabilities of our Precleaners, we will continue to be the brand you can trust and rely on for years to come. We invented the Precleaner and we will continue to improve upon its design while providing superior performance and reliability to our customers wherever they are in the world. turbo® Precleaners offer the lowest restriction and highest efficiency of any precleaner on the market. Our precleaners utilize a straight through flow path, meaning that the dirty air entering into the top simply flows straight into our guide vanes and the rotor chamber where centrifugal forces help to drive upwards of 85% of the contaminants outward where they fall harmlessly through the discharge slots. Only clean air then flows out the discharge into your machine. Your primary air filter sees less dirt, extending its life by 4 or 5 times! Competitors typically use “reverse axial” designs, meaning that the air enters the bottom of the precleaner, where it then must make a U-turn, adding restriction and robbing your engine of additional power. This makes them more restrictive, which means your filters don’t last as long. Also we have some of the most efficient designs available today, including our innovative Flex-n-Line and PowerRam, which are unique in their benefits and design. High quality bearings for trouble-free service.